Before the mammoth Gothic masterpiece at 50th and Fifth opened its doors in 1879, the Big Apple's first five bishops had their base at what's now the crossroads of SoHo, Little Italy and Chinatown. 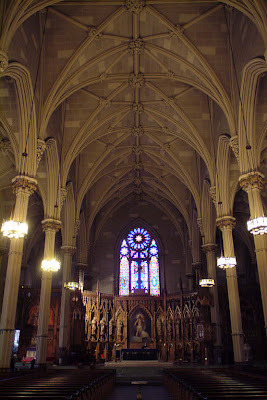 Within four decades, the fabled Gotham church grew to a degree that its famously-assertive first archbishop could flex his muscle and announce plans for a Midtown monument, but it was Old St Patrick's that witnessed the battles and trials the city's founding fold faced, nourishing the countless lives of quiet sacrifice and great devotion that paved the way to "The Powerhouse." And along the way, its history became as rich as the community it presided over initially wasn't... at least, materially speaking. Completed in 1815, the first cathedral never saw its first bishop -- the Irish Dominican Richard Luke Concanen died in Naples, en route to Manhattan. 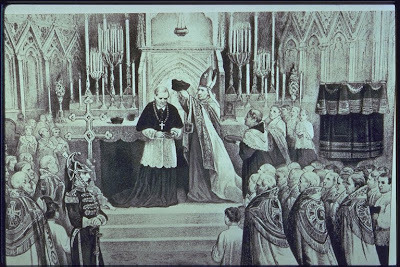 The third bishop -- Paris-born John DuBois, the lone non-Irishman ever to helm the New York church -- felt so reviled by the natives that, just as "they walked over [him] in life," he asked to be buried under the cathedral's front step, where he remains today. 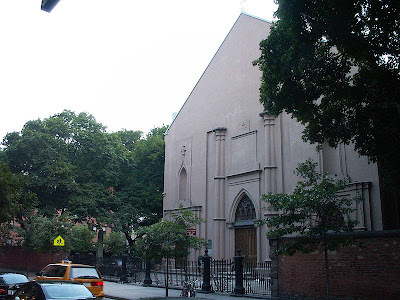 And while John Hughes died as an archbishop, not seeing his "cathedral of suitable magnificence" to completion, his successor -- the first American cardinal (who led the old cathedral's rebuilding after an 1866 fire gutted it) -- received the unprecedented scarlet biretta (below) not on Fifth Avenue, but in the sanctuary at Prince and Mott. America's lone bishop-saint was ordained a priest there, the grounds outside are the final resting place of scores of the church's first builders in the city, prominent and anything but alike... and in more recent times, the film buffs among us might enjoy knowing that the scenes from The Godfather were filmed within its walls. And all that's just scratching the surface. Like its successor, the old cathedral remains a popular spot for weddings, but the similarities mostly end there. Just as in the beginning, though, it remains a sanctuary for many of the newest to these shores -- half its Sunday Masses are in either Chinese or Spanish, while the Anglos who remain are a far cry from the first Irish and Germans who packed the pews two centuries ago. In a flash of its former spotlight, yesterday morning was just like old times -- the tenth archbishop returned to his predecessors' home-church to celebrate Mass, after which a parade made its way down Mott Street. Even more like old times, news was made again: the proto-cathedral might've held the bishop's chair for a third of its existence, but 130 years since that distinction ceased, a new one is likely at hand -- namely, Old St Pat's becoming a basilica. And luckily, like the beacon that's stood Downtown for two centuries, the latter honor can never be moved.